Ozotic is an Australian brand nail polish I have been wanting and waiting to try for a long long time. What attracted me immediately to this brand is their holographic colors. 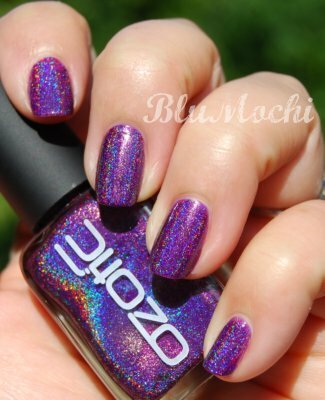 Not just any old holographic nail polish, but linear holographic! The good stuff that can't be found in the US, unless imported. Sadly, I never did take the plunge. I've admired them from afar, staring at beautiful swatches posted over my favorite nail blogs. Then last Christmas, I was gifted several Ozotic colors from a wonderful woman during a secret gift exchange. When I opened the the package, all I can say was "Wow!" Just one look and I was fast in love... gorgeousness! It wasn't just love; it was lust! 513 is a red-based grape purple linear holographic shimmer. Do you see that rainbow effect? That's what you call a linear holo! Under direct sunlight, the full spectrum of colors shines through. A lot of holographic nail polish can be a little challenging to apply, but I did not have any issues here. I started out with a thin coat. Drying time was pretty good, so it was not too long before I added my next coat. I could have probably got away with 2 coats, but I did 3 because I like the deeper purple look. I love a rich looking purple, it's so eye-catching and regal. I also must add that I used no top coat here because I was afraid that it would dull the holographic effect. However, I've have since read that fast-drying top coats (my favorite kind) will not lessen the look. I will have to test that out when I wear my other Ozotic colors. This also wore really well on me. Most of the time, holographic nail polish will only last a day, maybe 2 on me. I have been wearing this mani for 3 days now, and probably can go another day. Here's a close-up of the this amazing color... rainbow skittles. This just looks so amazing; I can't stop looking at my nails! I'm so ashamed for waiting so long to wear this. But believe me, I'm not going to wait too long before I put on the next Ozotic color. You are just the sweetest! I love your manis too! Thank you; it's really a fab polish. Your swatches are incredible Mochi! I have this one too, and it is in my top 10. What more could you want from a holo really?